I didn't want to post anything serious while on vacation, but I saw this article and couldn't let it go. 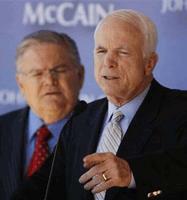 Yesterday, hard-line conservative Pastor John Hagee, founder of Christians United for Israel, endorsed John McCain. Hagee said that McCain is a man of principle, [who] does not stand boldly on both sides of any issue. McCain, who had been courting the endorsement for over a year, said that he was very honored by Pastor John Hagee's endorsement. The concern with John Hagee's endorsement and subsequent acceptance by John McCain, however, is that the destruction of Iran is a glaring central theme. Between McCain's "bomb-bomb-Iran" joke and Hagee's "it's God's plan to go to war with Iran," there's something uncomfortably sinister about the whole thing. "Russia is going to get in that position and they are literally, with all that massive military force, going to attack Israel," Hagee told ABC News in 2006. "This is recorded in Ezekiel 38 and 39. God himself is literally going to destroy that army. Decimate it." Hagee added that the confrontation would be followed by a Chinese army of 200 million coming to the city of Armageddon, where they will meet British and U.S. forces in the Battle of Armageddon. "At that point, Jesus Christ returns to Earth and sets up his eternal kingdom in the city of Jerusalem and there's 1000 years of peace," Hagee said. "The Jewish people are going to see the supernatural hand of God preserve them and deliver them while the enemies of Israel are crushed. That's the end-time story." Is McCain being urged to start a war by folks who believe it will kick off the end of the world? Under McCain, will America wage a holy war against Iran? It turns out that a lot of people like Obama. But you don't see Obama welcoming or accepting such endorsement. Because the US has been on an imperialist march under the neocons/corporatocracy, it makes sense for people who have hated America to view Obama's campaign favorably. Both Clinton and McCain are quite cozy with corporations. When you consider that the "spread of democracy" often equates to the spread of some mutant form of capitalism (no-bid contracts) and corporate-cultural infusion, the idea that Obama's campaign pushes for a separation of corporations and state (church and state?) is often interpreted as a relaxing on that imperialistic march. After the invasion of Iraq, America has been viewed as a bully and a thug. It's natural to me that the rest of the planet would support Obama. The issue with Hamas has some added complexity to it, due to the relationship with Israel. Conservatives often present the ruling administration in Israel as the "good guy" in the conflict, and view everyone else as terrorists. That's why mentioning Hamas creates such a knee-jerk reaction in so many people. Don't get me wrong -- I'm not defending Hamas. But news stories like the one you posted are meant to be incendiary. They're meant to connect Obama with Muslims, and when you consider the West Virginia battlefield, with people still thinking that Obama is Muslim, it should be clear that such articles aren't meant to inform - they're meant to herd the mob. Feeding the ignorance to fuel the spread of disinformation seems a little crooked. He accepted Jeremiah Wright's endorsement and he's far worse than some of the controversial things Hagee ever said. I'm surprised you made this post; it sounds like "McCain can't accept one controversial pastor's endorsement but Obama can." Lemmie guess, Obama has another convenient excuse you've bought hook line and sinker? Luke, I'm not sure why you've become so antagonistic on this issue, and why you think that my opinions have to be something that I've "bought hook line and sinker." Please stop the personal attacks. If this issue has become a stumbling block for you, I recommend you take up another issue. You think Wright is far worse than Hagee. We disagree. I think that Hagee's version of Christianity is problematic. I think that the notion of trying to usher in the end of the world and assuming that America is the instrument of God for that purpose sounds rather arrogant and self-righteous. Suggesting we destroy an entire nation because that's supposed to be "God's plan" is a rather hateful and racist. I think Wright's anger at white America after growing up with oppression and marginalization is justified; Hagee's suggestion that we wipe out Iran has no justification. Incidentally, I never said that Obama can accept a radical endorsement, and that McCain couldn't. I said I didn't think that Wright was a problem. I do, however, think that Hagee is a problem. And I think that McCain's "bomb bomb Iran" jokes are a horrifying insight into the kind of man he is, and realizing that's connected to Hagee on this issue reinforces my opinion of both of them.